Unbeaten TSG 1899 Hoffenheim entertain 1. FC Köln on Saturday (kick-off 15:30CET/14:30GMT), in an intriguing battle between two sides with designs on a top-four finish. Hoffenheim can match leaders RB Leipzig when it comes to avoiding defeat so far, but a run of three draws in a row – and seven overall so far – have seen them drop points and slip down to sixth in the table. Nadiem Amiri’s second-half equaliser preserved their enviable record to earn a point at Borussia Mönchengladbach on Matchday 12, but Julian Nagelsmann knows that a win could reignite their top-four challenge. The Billy Goats dominated proceedings against FC Augsburg, but were left frustrated by the goalless draw. They remain in fifth place, however, and their last away trip ended in victory at Gladbach. Moreover, the Billy Goats boast the joint-best defensive record in the Bundesliga this season, along with defending champions FC Bayern München. 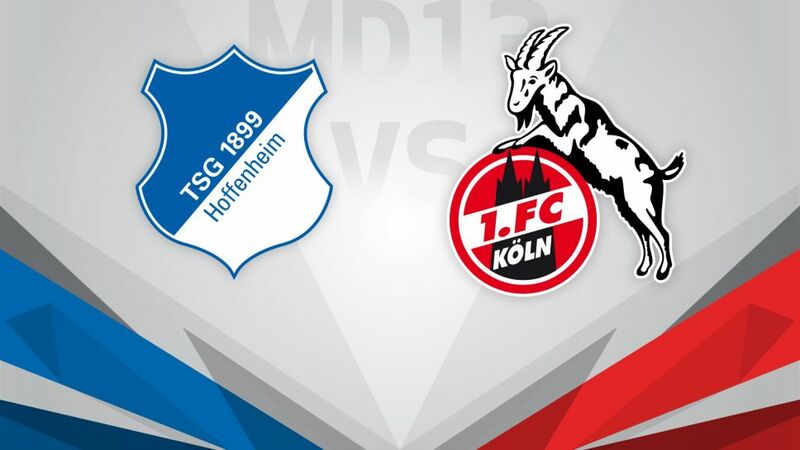 Hoffenheim are undefeated 12 games into the season, which is their longest-ever unbeaten streak in the Bundesliga.Köln led the league with 13 draws in the last two seasons, but it’s Hoffenheim who occupy top spot so far in the current campaign with seven.Twenty-two points from their opening 12 games is Köln’s best start in 20 years, while you have to go back 25 years for the last time they only had two losses at this stage of a season.Hoffenheim’s sole defeat in all competitions this season came against Köln in a 2-1 loss after extra-time in the DFB Cup 2nd Round. Former Hoffenheim striker Anthony Modeste scored the winner.Hoffenheim have come from behind to pick up points on four occasions this season, including last weekend’s 1-1 draw with Gladbach.Köln's Marco Höger is set to make his 100th Bundesliga appearance, five years after making his debut.